Visiting a new city is always a good time. Whether I'm adventuring in a quaint town or vast metropolis, I just never tire of experiencing a place for the first time. Luckily, my friends Megan and Philip were kind enough to be my tour guides and gracious hosts for a 72-hour trip to Denver, Colorado at the end of April. While the trip was a quick one, I learned five very important things about the Mile High City and the people who live there. 1. Denver's art scene is incredible! Who knew?! Not this girl. Yet, everywhere we turned, we came upon fantastic public art, street art, galleries and museums. I couldn't stop finding cool things to capture. Nice work, Denver! 2. The city is full of cool neighborhoods. If there's one thing I like about exploring a new city, it's figuring out where the locals go to eat, shop and hang out. Megan and Philip were on board and we walked around several super cool districts and neighborhoods throughout the city. While I didn't do the best job capturing all of the awesomeness, I definitely appreciated them showing me around and I have a nice long list of places to check out next time I'm in town. 3. Denver's public transit is alright by me! Seriously. It's pretty great. 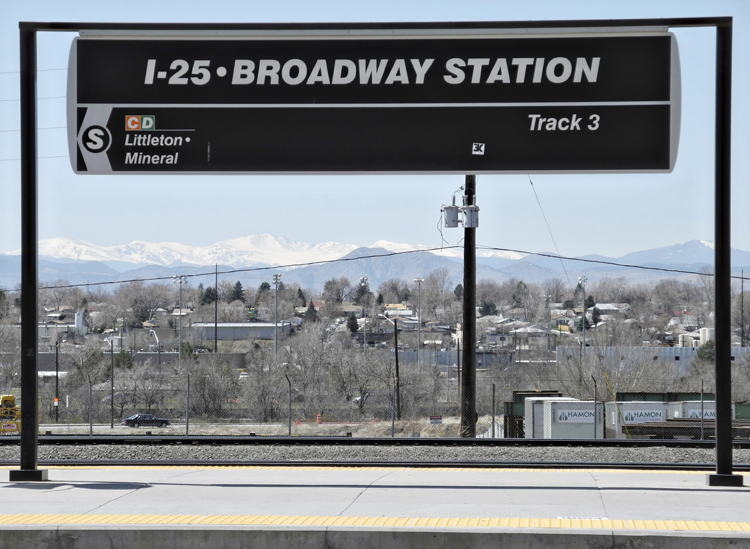 Sure, it's no underground subway, but Denver's public transit system gets the job done. We were able to check out much of the city via the light rail and free shuttles (in downtown). Plus, taking public transit meant we could have a drink (or two) while taking in the sights! 4. Denver is definitely a university town. The University of Denver is beautiful. Philip is currently working toward his MBA and he and Megan showed me around campus one morning. As we explored the areas surrounding the university, it became clear to me just how much fun happens off campus. Sports bars, restaurants, you name it... they've got it. 5. When the sun is shining, the people of Denver love to get outdoors. So here's the deal: I flew in on a Friday. It had been snowing two days before I arrived. I left on a Monday and they were expecting a huge spring storm to dump more snow by Wednesday. In between, however, we enjoyed gloriously sunny days. Megan took me to Washington Park (pdf), which is one of the largest parks in Denver. We soaked up all of that sunshine (and people watching) like nobody's business. 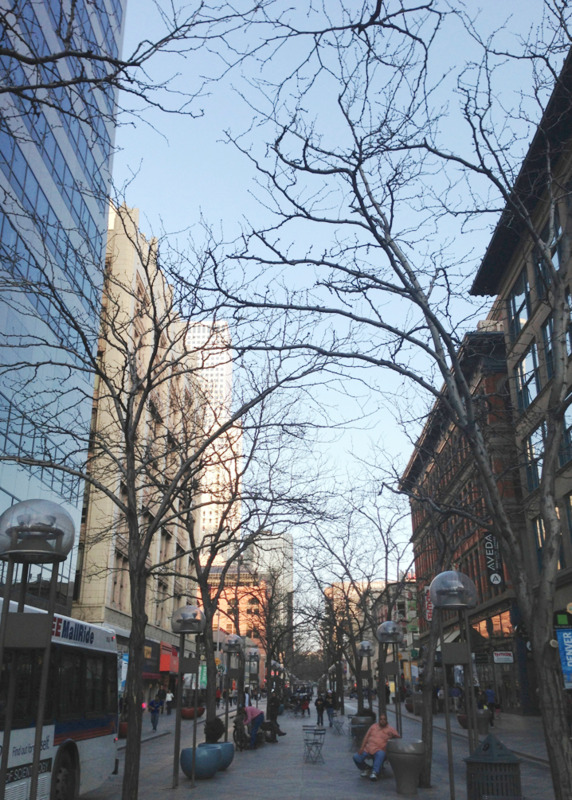 After spending a few days in Denver, I left wishing I could have explored a little more. I suppose that's the way you want to leave a new place, right? Wanting just a little more time? I have a feeling I'll be back in Colorado to visit Megan and Philip very, very soon. Have any of you been to Denver lately? What were your favorite sights to see or things to do? Have you ever left a city and wished you could have just one more day to take it all in?